Cook pasta as directed on package. 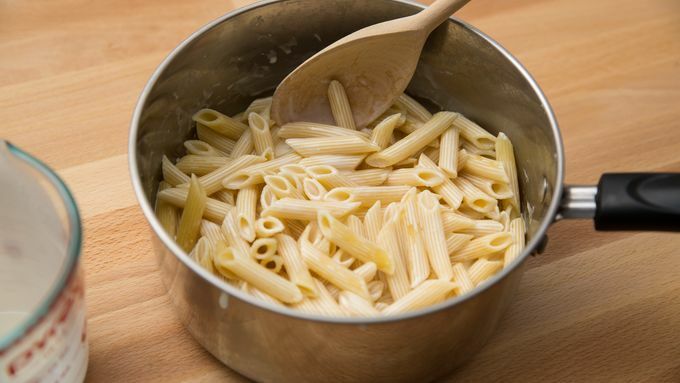 Reserve 1/2 cup pasta cooking water. Drain pasta; return to stockpot. Add cream; toss. Set aside. Spray 12-inch sauté pan or skillet with cooking spray; heat over medium heat. Add bacon; cook until crisp. 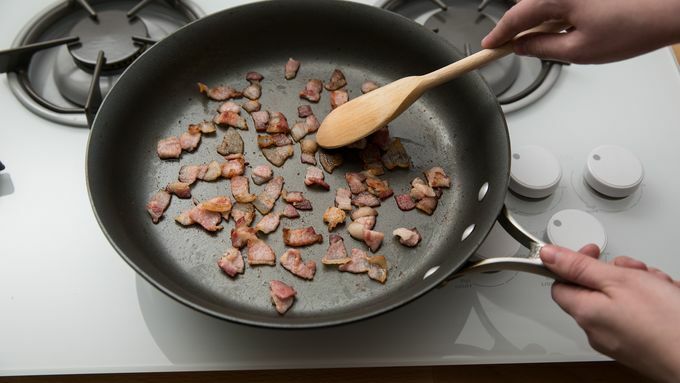 With slotted spoon, remove bacon from pan to plate; set aside. 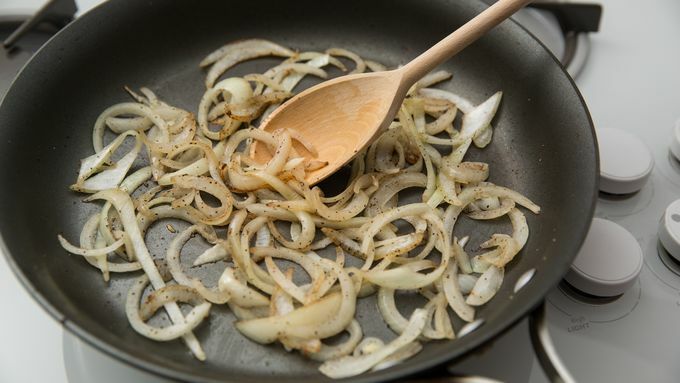 Add onions, salt and pepper to bacon drippings in pan; cook and stir 4 to 7 minutes or until translucent. Add mushrooms; cook 6 to 10 minutes longer or until browned and liquid evaporates. 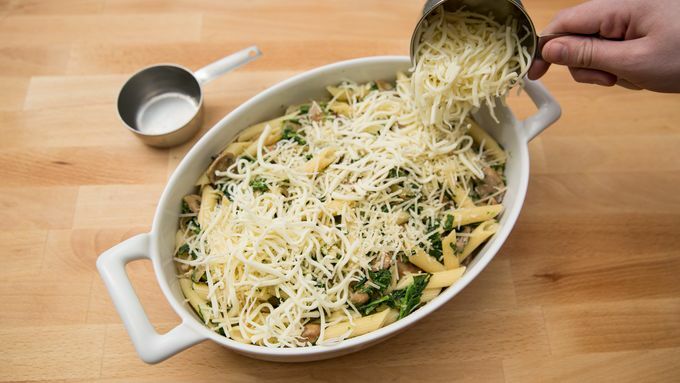 Add spinach and reserved pasta cooking water; cook and stir 1 minute. Pour mushroom mixture over pasta; toss to coat. Pour into baking dish. Top evenly with both cheeses. Cover dish tightly with foil. Bake 20 minutes. Remove foil; top with reserved bacon. Bake uncovered 5 minutes longer. 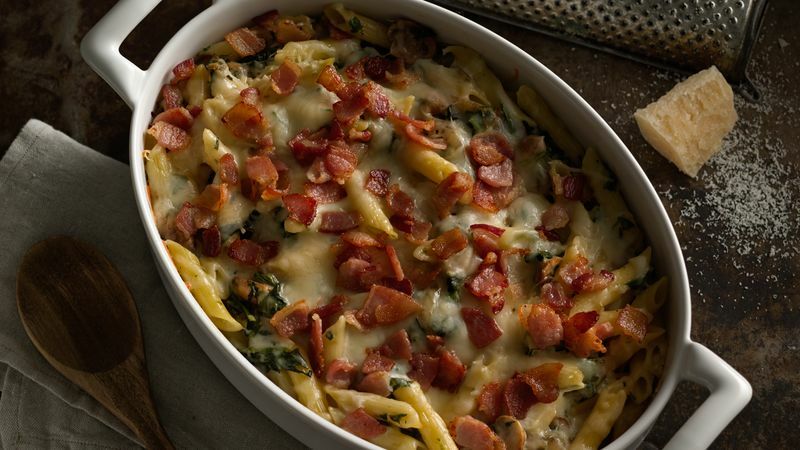 Prepare and assemble the casserole, without baking, up to a day ahead. Bake at 350°F for 40 minutes. Then, remove foil, add bacon and bake 5 minutes longer. Lose the bacon for a meat-free twist, or just add bacon to bacon lovers' bowls for a pasta that pleases vegetarians and meat-eaters alike.